One from my grandparents’ library, highly recommended for Sinatra’s performance as a hired assassin. It sounds like a tight-knit drama, since it concerns a hitman taking over a small-town household, but it has the potential to be a political thriller, since it concerns an attempt to assassinate the president. Either way it seems like a movie I’ll be gladder to have seen than to watch, but it comes highly recommended. 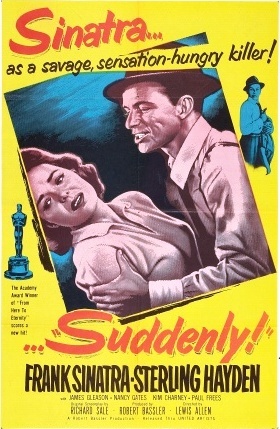 There was a poster I liked better showing a Sinatra that looked more like a killer than like he’s crooning about what he’s going to do to this woman, but I try to keep to posters that have a traditional poster shape. Nothing ever happens anymore in the oddly-named small town of Suddenly, California. Tod, the local sheriff, is trying to court war widow Ellen, but is making more traction being a father to her son Pidge. When Tod receives a telegram advising that the President is going to be making a top-secret stop in Suddenly to transfer from train to car, local and state law enforcement spring into action like the town hasn’t seen in decades. Secret Service agents arrive to sweep the area, but the house in perfect view of the station is Pop Benson’s house, former boss of the lead Secret Service man and Ellen’s father, so the director and Tod plan to personally check in there last, by which time John Baron’s trio of phony “FBI agents” have already inveigled their way into the home as the place they plan to set up their sniper rifle, taking the Bensons and Tod hostage while they wait for the train. This is actually very apolitical. The President is a Macguffin, and Baron has no idea who actually hired him or why, just that he has a job to do. All of this is principally just to explore the mentality of a man who was nothing until the army put a gun in his hands and he discovered he liked killing. More broadly, it also explores how the war changed many, as Tod learned to fight for justice from his time in service, the death of Ellen’s husband made her hide from violence and try to isolate Pidge from it for as long as she can, and Pop learned useful skills in World War I. It may be that everyone has war in their backstory because it was impossible to avoid the two world wars, but it can’t be a coincidence that there’s a debate about what exposing Pidge to war and violence would do to him and then a monster of the war’s making lands on their doorstep. I wish there would have been more ambiguity to the discussion about how to raise Pidge, perhaps pointing out that glorification of violence would at best give him wrong ideas and at worst make him a monster like Baron, but the only argument Ellen gives is that if any hint of vioence or danger whatsoever crosses his path, he’ll trot off to war and promptly get as murdered as his father, and as his mother, she’s going to shield him from that forever, by God. She’s portrayed as nothing more than an irrational, emotional woman that nobody agrees with. The scenes introducing Tod, Pidge, and Ellen are particularly wooden, though aside from Pidge saying very complicated adult sentences, I’m not sure if it’s more the writing or the acting to blame. Most of the characters feel stock (Kid, Mom, Hero, Gangster), but Pop is quite a lively schemer that rises above the minimum. Playing Baron gives Sinatra a lot to work with, and when he diverts from playing Gangster, he meets the challenge well, though he usually the lines with the most impact directly to the camera, which I consider a poor choice of direction rather than acting. He gets only a brief moment where Baron is at a complete disadvantage, and he manages to consummate an hour of speeches about his backstory in his one line in that moment. Sinatra shows us the real Baron, the man before the war, before the gun. To think I once thought of his acting career as just another singer dabbling in movies. This is theatrical, in some of the most expansive and limiting ways, but it eventually warms up into a compelling and tense character study that leaves its central question not entirely answered, even if it does sandbag some of the options.